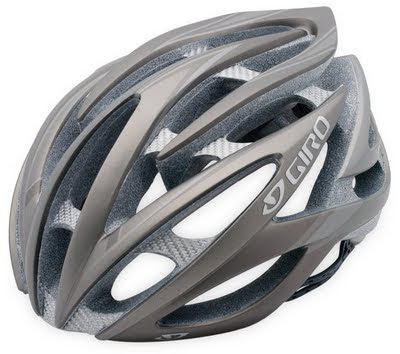 After many years, and thousands of miles, of cycling without a helmet I've finally succumbed and bought a new 'lid'. Helmets are an issue that provokes heated opinions on all sides. For the record, the Highway Code recommends that cyclist use helmets, but it is not backed up by law. Personally, I think it's up to people to make up their own minds, after all it's their head. Having said that, research on the protection offered by cycle helmets appears to be limited and open to interpretation. Some people claim that wearing a helmet causes people to cycle more recklessly and encourages drivers to treat them with less care. Common sense would seem to suggest that it is safer to wear one. I've had drivers be abusive to me for not wearing a helmet and there have been court cases where it was regarded as 'contributory negligence' to injuries received (in the same way as not wearing a seat belt in a car). Cyclists do seem to be expected to exhibit a far higher level of self-protection than drivers - I still see loads who don't use seatbelts and I've never met a person who's been prosecuted for that, or being on the phone. And when was the last time you saw a pedestrian wearing reflective clothing when walking at night, even though that's what the Highway Code advises? Anyway, controversy aside, after a bit of research I came up with the Giro Atmos. As well as being lighter and smaller than most helmets, the Atmos is extremely well ventilated to help keep you cool and less sweaty. And if it's good enough for Lance Armstrong, who can argue? It’s been quite some time Orient got into making the rolex replica sale. It is the signature-type pieces from Orient and this one comes with something extra - a slide rule. The construction and finish of the replica watches sale doesn’t require to be told. The shine and the fluid dynamics are all visible by themselves. The grooves on the crowns, the solidity of the pusher and the rolex replica crown guard – all speak for themselves. It is still a mystery how Orient manages to keep things replica watches uk so well-done at such low prices! The pusher at the 2 o’clock position sets the multi-year calendar. The crown at the rolex replica uk 3 o’clock position screws-in and locks. You set the date and time with it, at the hublot replica first-click and at the second-click positions, respectively. With the 4’o clock crown, you rotate the slide rule.